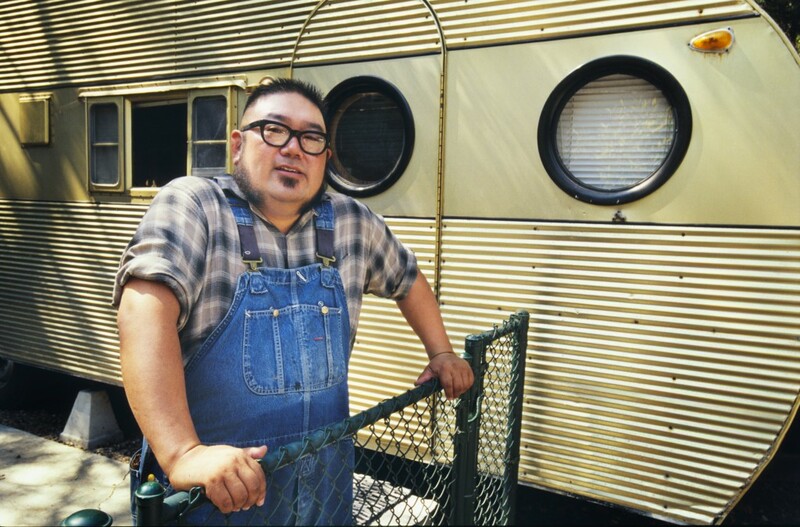 This Authentic Portrait of Ed Lum is part of my personal work seeking vintage trailers. Personal work like continuing education keeps sharpening your skill set and adds to the “10,000 hours” I mentioned in the first of this Authentic Portraits series. Ed lives in a trailer park in Monterey Park, right next to Pasadena, California. I just showed up because of an article I read the day before in the Los Angeles Times about the trailer park. Ed does not live in this gold tone Airfloat trailer, but it was the rarest in the park and a vintage travel trailer. Most all the trailers in the park were vintage park types, versus the typical travel or pull types I seek. It was highlighted in the paper since the place has a history going back as an Auto Camp on Route 66 and further to the days as a Pony Express stop. My experience and with Ed, when I explain what I am looking for and why, most folks are very cooperative and are very helpful with suggestions and willing subjects. Ed is in his element, relaxed and authentic.